Did you know what you eat and drink and how much you exercise can play a role in your digestive health? Exercise plays a huge part in digestion. Regular physical activity increases blood flow to your organs and helps you to maintain a healthy weight. It also helps to keep food moving through your digestive system and reduces constipation. Food processing and preparation combined with lifestyle can impact how we feel and how our body digests it. Here are some ideas of foods and drinks to consume more and less of when it comes to digestive health. · Water – helps you to flush out your body of bad toxins and keeps your digestive system working efficiently. · Yogurt – contains probiotics which regulates the amount of healthy bacteria in your system and normalises bowel movements. · Lean meat – try turkey, chicken or pork, which are usually leaner than red meats. · Kimchi - a Korean favourite usually made with cabbage, radish, or onion and spices. The main ingredient is usually cabbage, which promotes the growth of healthy bacteria in the colon. Be cautious of spices though if they trigger digestive problems for you. · Wholegrains – full of fibre which is good for digestion e.g. brown rice, oats, nuts, whole-wheat bread. · Ginger – can help to relieve nausea, vomiting, motion sickness, morning sickness, gas and more. · Fatty food – takes a long time to digest and can cause constipation. · Fried food – can result in reflux and heartburn, as well as the above. · Diary - this applies to those who are lactose intolerant which causes diarrhoea, gas, bloating and cramps. · Alcohol – can lead to acid reflux and heartburn. Can also inflame the stomach lining and cause cramping. · Caffeine (coffee, tea and soft drinks) – can cause cramping but can also act as diuretics. Can also cause problems for people with reflux. You can also combine healthy eating and regular exercise with our Probiotic – a digestive health formula delivering probiotic with prebiotic in a sachet, and HepaPlus – a liver tonic which supports the normal detoxification process. You can even use our USANA products such as Fibergy, Nutrimeal, Probiotics….but we want you to use them in a new and creative way! 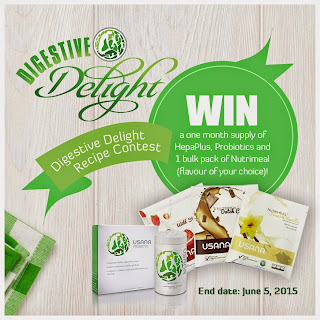 Then head onto Facebook and “like” the USANA Australia New Zealand Facebook page, take a photo of your creation and upload to it your personal Facebook account with #digestivedelight by June 5, 2015. Make sure your post is public so we can see it. The winner will be announced on the USANA Australia New Zealand Facebook page and will win a one month supply of HepaPlus, Probiotics and one Nutrimeal bulk pack.